When you’re tired of working in a huge office, working from home can sound like a dream come true and is a benefit that a contractor can avail of at times. Many contractors are free to work remotely for their clients but it is important to maintain a healthy work/life balance at the same time. Here’s a guide to maintaining a work/life balance while working at home that will make sure you stay as productive as possible. It’s lovely when your office starts to feel like a home. It’s not so lovely when your home starts to feel like your office. If you do work remotely then make sure that your home office is kept separate from your living quarters. That way, when you shut the door, you’re at work, and when you leave in the evening time, you’re truly going home. You won’t be getting up and down to go to meetings, or to gossip about why Tara looked so happy at coffee break this morning, so chances are you’ll be spending a lot more time sitting down. So make sure to get a chair that’s designed for your needs. Standing desks are all the rage at the moment, and might be worth trying out to see what difference it makes for your productivity. 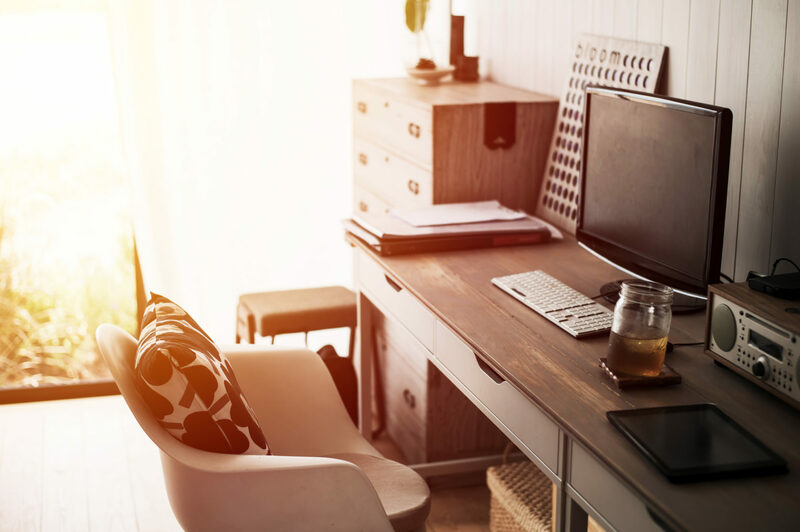 If you do work from home, the chances are, you’ll be spending a lot of time in your home office (provided you have a space set aside for it (Tip 1)), particularly when starting out on your career as a contractor. So it’s worth the time and money to make it into a place where you actually look forward to going. You don’t have to spend a massive amount of money. Websites like Pinterest and Etsy are a treasure trove of economical and beautiful home office design ideas. As a contractor working from home, there’s no-one looking over your shoulder, and tut-tutting when you arrive in ten minutes late in the morning. You also have no excuse to be late, because it’s not like you can claim you missed your bus. One of the major benefits of being a contractor is the freedom to choose your own working-hours, but make sure you choose them wisely, and that you put pressure on yourself to stick to them. No matter how bright and beautiful your office might be, it’s unrealistic to expect that you’ll be happy working from the same corner of your house for weeks and months on end. If you find yourself on the edge of a bout of cabin fever, get out and about and see a bit of the world. If you’re working from home, chances are you’re also well placed to work from a coffee shop or local library. And when you encounter chatty customers and sky-high coffee prices, you’ll be dying to get back to the comforts of your home office! There is nothing worse than a cluttered working environment and what’s even worse is when that cluttered working environment is you own home! Keep it clean, file paper work away into a filing cabinet or even better, aim for a paperless working space. First time contractors will think that they will have to keep reams and reams of paper records and receipts for their end of year return and monthly expense claims. This is not the case. With Contracting PLUS everything is kept on an online portal and our Tax and Payroll Teams will ensure that all the admin and paper work is carried here and not in your own home! To discuss in any more detail on the benefits and ease of being a contractor, either from your own home, or in an office, feel free to contact Contracting PLUS on 00353 1 611 0707 or via email to info@contractingplus.com. We’d be delighted to help!